On July 16, 1877, railroad workers in Martinsburg, West Virginia, walked off their jobs in response to a 10% wage cut instituted by the Baltimore & Ohio Railroad. Wage cuts had become common practice on the railroads, in fact throughout American industry, since the onset of a severe depression in the fall of 1873. For four years American workers had passively accepted such reductions, had allowed their newly organized unions to collapse, had showed hardly an inkling of resistance. Yet with no warning, on that Monday morning in mid-July, a handful of Martinsburg railroad workers decided that they would take no more. Their example—their refusal to submit any longer to the dictates of one of the nation’s most powerful corporations, their armed resistance against strikebreakers, thugs, police, and the armed forces of the state—struck a responsive chord across the country. Following the main railroad trunk lines from Martinsburg to Baltimore to Pittsburgh to St. Louis to Galveston to Chicago, and at one small city after another along the way, a local strike became a national strike, became an insurrection. The powerful railroad corporations had for years been seen both symbolically and materially as the essence of the industrial order developing in America. Railroad magnates like Tom Scott of the Pennsylvania Railroad were accurately perceived as crass capitalists, able and willing to control-state and local governments through bribery and blackmail. Time and again, struggles against them in many cities had seen an out-pouring of massive public support for strikers. But this time, the battle was not to be waged in any one city alone—it swept the country as fast as the news of confrontations could be carried. The scene was repeated in city after city, state after state. Railroad workers struck, forcibly halted the flow of traffic, were joined by crowds of local workers and their families, engaged in pitched battles with state militia and private armed units, and held firm. Clearly, far more was involved here than a 10% wage cut. In Pittsburgh, armed struggle between troops imported from Philadelphia and local men, women, and children resulted in twenty dead, a rout of the troops, and the burning to the ground of the main railroad depot and some 104 locomotives and 2,000 cars. 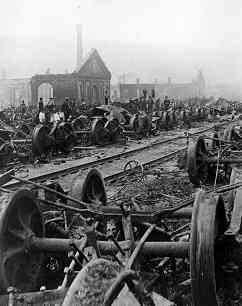 Commodities were expropriated from freight cars and storage areas and distributed among the crowds. The local armory was seized, and its store of guns and ammunition similarly distributed. The balance of forces varied from city to city. In some, the troops gained the upper hand. In others, the Pittsburgh victory was rivaled, though with less bloodshed. In a few, it was even surpassed. General strikes appeared—workplace after workplace was deserted—and city-wide coordinating bodies were organized. In St. Louis, where this process went the furthest, a committee of strikers and members of the local Workingman’s Party, took over the economic and social management of the city. This was celebrated by a massive parade of strikers, black and white, men, women, and children, led by a flag-staff adorned with a loaf of bread, which wound throughout the city’s streets. Train traffic was started up again, but now under the strikers’ control. It was also decided to re-commence production in certain industries, such as the baking of bread. Decisions about what and how to produce had replaced decisions about how to shut it all down. Despite the remarkable spread of the strike, the local power manifested by armed workers soon proved itself no match for the power of the army and militia units brought in from other cities where the strike had not taken hold. Troops under the centralized control of the federal government gradually regained control in one locality at a time. The strike collapsed as mysteriously and bloodily as it had begun. Regardless of its failures, this insurrection of one hundred years ago stands as an indication of the potentialities of mass explosion. With no advance warning, a struggle in a small town had generated an uprising, one which went beyond the expectations of “labor leaders,” “socialists,” capitalists, and politicians alike, indeed beyond the expectations of the first strikers themselves. Its implicit goals—the desire to live creative and productive lives free from the dictates of capital—seldom received articulation and were only lived in the intensity of battle itself. These unrealized goals and others which we dream of remain just that—but we must never think that we will never experience their realization. What did people like us think on July 15, 1877, the day before those Martinsburg railroad workers decided they had had enough? Note: A detailed account of this insurrection may be found in Strike! by Jeremy Brecher, available from Ammunition Books. [See also: Revised edition published by PM Press; online (PDF and EPUB) versions at libcom.org].